Awhile back, one of you asked how the lemongrass that I started from grocery store stalks turned out. Since it was growing in my community garden plot, I didn’t take as many pictures throughout the summer as I typically do for plants here in the Demo Garden. 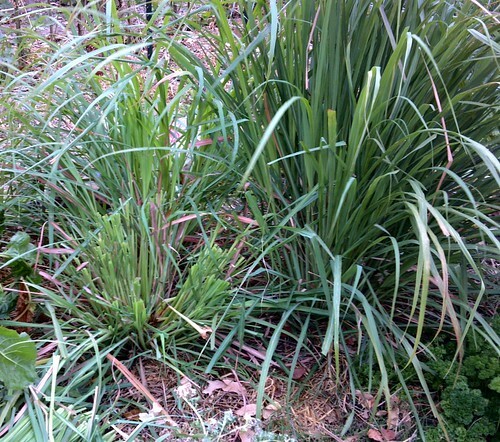 I took several pictures of the lemongrass, which you can view here if you want to see them all. However, in most of the pictures it just looks like a green blob of grass. This picture actually shows you the size of the stuff in context! It is really a beautiful fountain-shaped grass, and it gets BIG! By viewing it through the cattle panel, you can see that it is probably 4 to 5 feet tall in September. It looks like a fun grass to play in, but just a warning – those grass blades have sharp edges. I recommend long sleeves and gloves when you get ready to harvest. To harvest, I took pruners and cut off the grass about 18″ above the ground, then I got right into the base and twisted each of the large stalks off. It’s a little bit hard to describe the harvesting process, and I don’t have a really good picture. The key is bending each stalk right at ground level and twisting to pull it out, because the base is where the best usable part is. 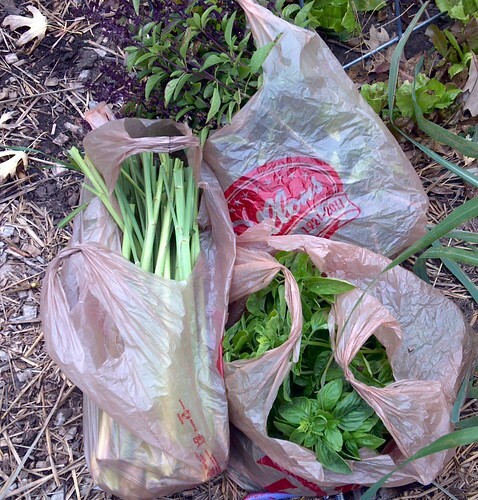 I ended up with a grocery sack of lemongrass stalks from just one plant, and that was only taking the large stalks! (Lemongrass really likes heat!) You can see I also harvested some basil and Thai basil at the same time. We’ll deal with that in another post. 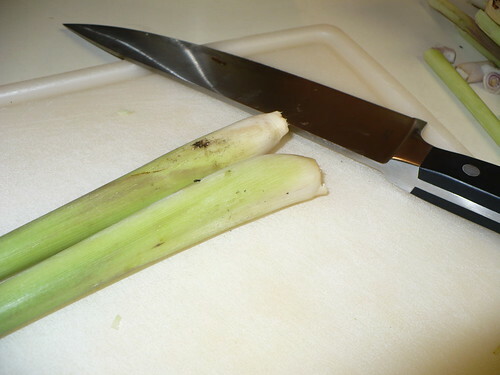 This is what the stalks looked like before cleaning. I took 1-2 layers of the outer leaves off and trimmed off the woody base. You can see the nice white ends on the stalks. Anyway, I didn’t remove those tougher parts because I was lazy and also because I was planning to pulverize it all anyway. 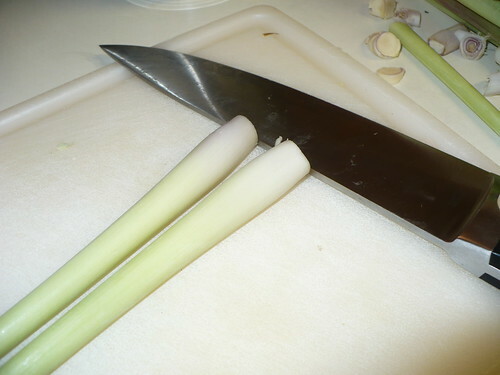 Here you can see the ends in the bowl, along with all the remaining stalks. 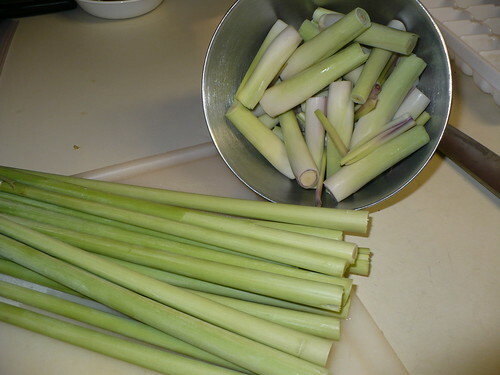 The ends were about 4 cups worth of lemongrass…plenty to last us a couple of years, probably! 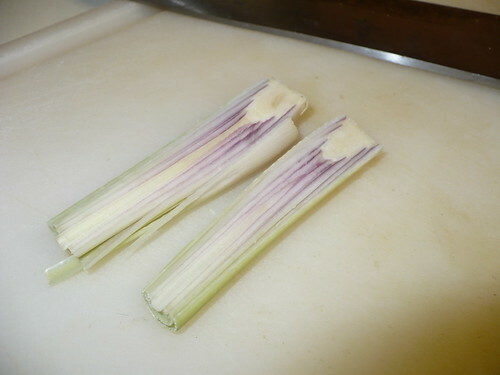 I hated to just pitch the stems though, and I don’t love lemongrass tea enough to go to the effort of drying them. More on that later. 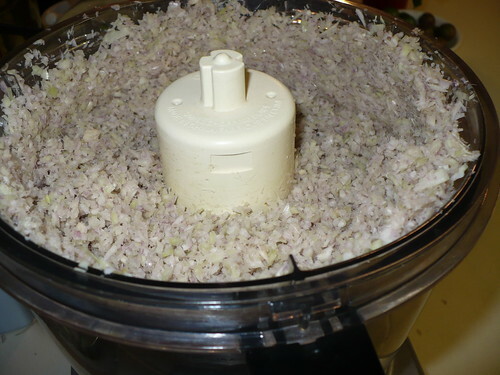 The ends all went into the food processor and came out this lovely fine minced lemongrass. Yum! So, now what? I chose 2 methods of preserving, and we’ll see which I prefer. 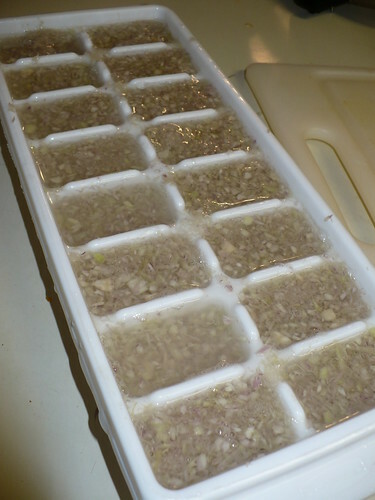 Method 1: Put a heaping tablespoon of lemongrass in each ice cube slot and then cover with water. (You can also use olive oil.) Freeze, then store in a bag in the freezer. I’ve used the ice cube method before for basil, and it is my preferred method for storing basil. 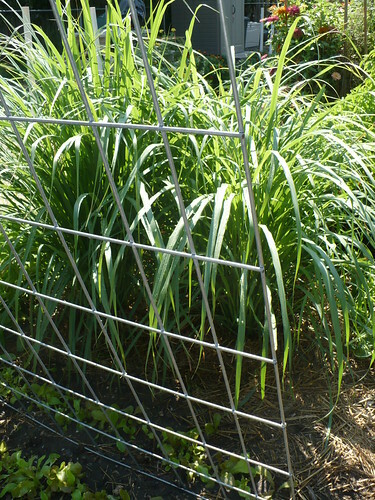 We’ll see how the lemongrass fares. 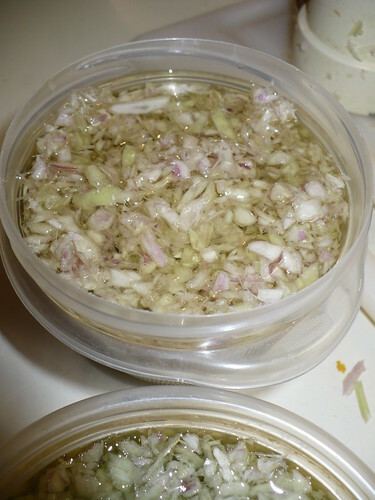 The remainder went into two 1 cup containers and I covered them with grapeseed oil. I had grapeseed oil on hand, so I used that instead of lemongrass. FYI, grapeseed oil doesn’t solidify in the freezer. Olive oil does. Yes, I learned that the hard way. So the pro of using the grapeseed oil is that it will be really easy to scoop out lemongrass when I want it. The con is that I have a potential mess on my hands if something goes wrong in the freezer… Not that anything would ever topple over in my immaculately organized freezer. Right. Now the question was, what to do with those remaining lemongrass stalks? Since I didn’t want to make tea, I decided on another use that would involve infusing a liquid with the nice lemony flavor – making chicken stock. Or rather, as it turned out, making turkey stock. I happened to find 3 packages of turkey legs on the “use them now before they go bad” special. I ended up with about 3+ quarts of turkey stock when I strained it. I saved 6 cups to make a Turkey-Wild Rice Soup, and the rest I boiled down until it was about 4x concentrated and froze it in ice cubes. I’m all about the ice cube trays for everything except plain old ice cubes, apparently. I don’t know if it was the vinegar or if I just was lucky, but this was the first time that I’ve had stock turn into stock jelly when I refrigerate it. It was pretty cool! 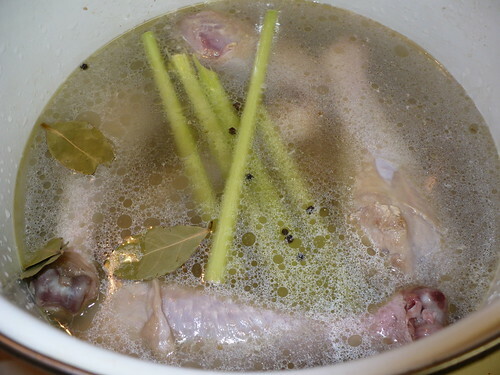 If I’d been really motivated, I could have saved the turkey bones and made another batch of stock with them. This was enough of a project for me though, and I didn’t exactly have space for more stock, since we don’t have a pressure canner (and they kind of scare me anyway). The stock was really good! I was afraid that we wouldn’t actually be able to taste the lemongrass, but it was there. Not overpowering, but not lost in the other flavors. One other note…I didn’t actually put any salt in at any point other than very lightly salting the legs before browning. 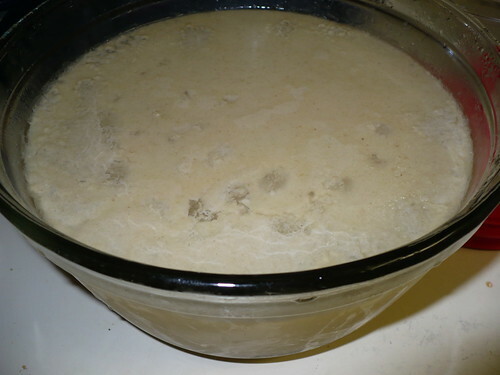 You don’t want to salt the stock and end up with a salty mess when it gets cooked down. Much better to add salt when you are actually using the stock to cook. So…if you have some extra lemongrass kicking around, you now have something to do with that turkey carcass! Posted on November 21, 2012, in Harvesting & Eating and tagged cooking, food, herbs, lemongrass, preservation, preserving. Bookmark the permalink. Leave a comment.